ETAP is the global market and technology leader in electrical power system modeling, design, analysis, optimization, control, and automation software. The company has been powering success for nearly 30 years by providing the most comprehensive and widely-used enterprise solution for generation, transmission, distribution, industrial, transportation, and low-voltage power systems. 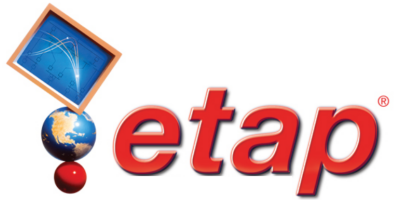 Founded in 1986, ETAP is headquartered in Irvine, California, USA, with offices around the world. ETAP is the global market and technology leader in electrical power system modeling, design, analysis, optimization, control, operation, and automation software. The company has been powering success for nearly 30 years by providing the most comprehensive and widely-used enterprise solution for generation, transmission, distribution, industrial, transportation, and low-voltage power systems. ETAP software provides engineers, operators, and managers a platform for continuous functionality from modeling to operation. ETAP’s model-driven architecture enables ‘Faster than Real-Time’ operations - where data and analytics meet to provide predictive behavior, preemptive action, and situational intelligence to the owner-operator. At ETAP, we harness the thinking power and the passion of our engineers, scientists, and industry experts to transform the spark of ideas into products that can fuel the global economy. More power system experts trust ETAP for their most demanding projects. Our mission is to provide state-of-the-art products and superior engineering services by combining advanced technologies with the highest standard in quality to achieve overall customer satisfaction.